Ten top things to do in the Harrogate area this week. 2. Harrogate Film Society presents Suzanne (France, 2013) at Ashville College, Green Lane, Harrogate on Monday February 18, 7.45pm. Described as “a stunningly confident piece of filmmaking”, the screening of “Suzanne” (France, 2013) on Monday 18 February at Ashville College at 7.45 will please all fans of French films. It tells the story of a family and a torrid love affair told through the journey of 25 years by a young woman. Members free, guests £5 (students £3). 3. Fab Feb Family Fun at Lightwater Valley, Ripon, Thursday 21-Tuesday, February 26, 10.30am-3.30pm. Lightwater Valley is inviting families with younger children the chance to enjoy a fun-packed February Half Term – whatever the weather. Aimed at the Under 8s Fab Feb Family Fun features a host of fantastic indoor and outdoor events and activities on offer throughout the holidays. There will also be special UV puppet show performances in the brand new show barn. 4. Harrogate Indoor Funfair, Yorkshire Event Centre, Harrogate, Monday February 25 to Sunday March 3, 10am-1pm and 2-5pm. The huge Hall 1 will once again be filled with rides to suit all ages from dodgems and waltzers to the cup and saucers and fun house for youngsters. There will also be new rides including a twister, crazy bulls, jump and smile as well as a large selection of children’s rides. All rides are free once admission is paid for, either in advance or on the gate. Admission is £10 on the gate for either the morning session (10am – 1pm) or the afternoon session (2pm – 5pm). 5. Snowdrops, Goldsborough Hall, Goldsborough, February 10-17, 10am-4pm. The spectacular display of snowdrops in 17th-century Goldsborough Hall’s 12-acre royal gardens are made up of single snowdrops Galanthus nivalis and double Galanthus nivalis flore pleno. The Snowdrop Walk has over 60 rare varieties of snowdrops – some so rare they haven’t yet been named. Adults £5; children free. Refreshments available. Dogs on leads welcome. 6. Modern mosaics exhibition, Old Bath House, RHS Garden Harlow Carr, to March 3. Around 20 mosaic artists from across the region have produced creations with a theme of Lost Words, based on many of the nature-related words that have been removed over recent years from the Oxford Junior English Dictionary. 7. Royal Hall Open Day, Harrogate, Wednesday 20th February 20, 10am-4pm. People will be able to see behind the scenes at Harrogate’s Royal Hall, otherwise known as the “glittering palace of gold”. Guided tours will be at 11am and 2pm. 8. 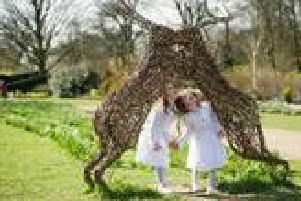 Wild Wood Adventure, Fountains Abbey and Studley Royal, Ripon, Tuesday February 19-Tuesday February 26, 1-3pm. Den building competition. Visitors can learn how to make their own den using sticks from the estate. They will then be tested to see how watertight they are. The activity is among many planned for half term. 10. The Mini Magic Flute by Opera North, Monday February 18, Leeds Central Library Room 700. Suitable for children from 4-years. Tickets, £4-£8 online.